… is a content, communications, and digital strategist. She’s currently the Director of Content and Communications at Bresslergroup, a product innovation lab in Philadelphia. Caroline’s background is a blend of journalism, publishing, and digital marketing. 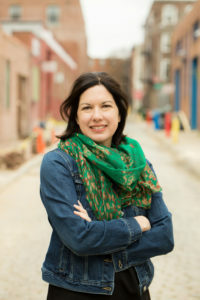 She learned journalism on the job at Philadelphia magazine and then as a freelancer, with articles appearing in many publications, including Metropolis, Communication Arts, National Geographic Traveler, and the New York Times. She started out in books, working as an editorial assistant at Simon & Schuster on R.L. Stine and other young adult series — down the hall from the Star Trek imprint. She went on to write and ghostwrite a bunch of books on topics from etiquette to the American Revolution. Caroline has also provided content development and consulting services to a wide range of companies and nonprofits. And it’s been fun now and then to mix up storytelling techniques with some curating. When she’s not doing the above, she’s probably hanging out in Queen Village, Philly’s oldest (and most charming) neighborhood, with her husband and two kids. For general inquiries, or for an earful about local design or Philly politics, please email her at [email protected].